Edmund Gwenn is Kris Kringle; a nice old man who has been hired as the Macy’s Department Store Santa. When he claims to be the real Santa the store have him institutionalized as insane. However a young up and coming lawyer decides to defend him and prove in a court that he is indeed just who he says he is. This movie has appeared on many lists of the greatest all time Christmas movies so I was eager to find out if it was as good as people had said. Indeed it was. To put it quite simply this is a nice little movie. Edmund Gwenn’s is marvelous as the charming and kind hearted Kris Kringle; whose presence lights up the screen. Natalie Wood is absolutely adorable as little Susan Walker. Such a talented actress at only ten years of age is truly remarkable. The movie does a great job of really capturing the essence of the era in which it was filmed; a time when thing were simple and much more care free. Overall this is a wonderful movie to watch with family and friends over the holiday season. This and It's a Wonderful Life are two absolute must watches for me every year at Christmas time. I think this movie is just wonderful! This and It's a Wonderful Life are two absolute must watches for me every year at Christmas time. Don't forget A Christmas Carol (1951) with Alastair Sims. Totally agree. 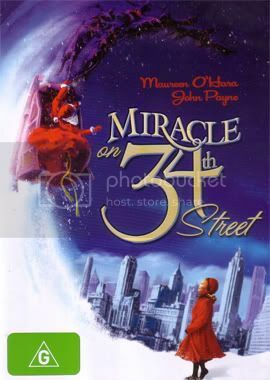 I watched it straight after I watched Miracle on 34th Street. I had a brief look at the colourised version. It looks good and picture is very sharp, but it still doesn't look very natural. It's very obvious that's been colourised. Yikes....how could I have forgotten that one! Blasphemy! You are of course, correct! There are too many Christmas movies to watch. Maybe when I'm as old as you Hal I will have seen all the classics. When you're as old as me, there will be a lot more classics that you'll have to watch, you whippersnapper!!! That's very possible, but judging my standard of movies these days I personally doubt that there will be many more. Actually, judging the quality of movies being produced these days, I fear you may be right. Then again, It's a Wonderful Life was a relative flop when it came out! That's true, but the flops of today will always be considered as flops.